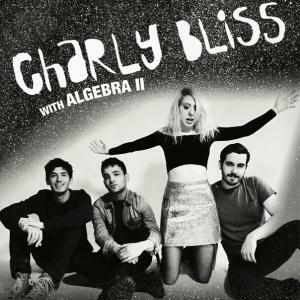 Charly Bliss is a Brooklyn-based rock quartet that has made a name for themselves with their upbeat, 90’s alternative sound that has been described by critics as “bubble-grunge.” I discovered them when they opened for Tokyo Police Club at Irving Plaza back in 2016. They immediately caught my attention with their raw and energetic stage presence. When I found out they would be playing at the Wonder Bar in Asbury Park on March 8th, I jumped on the chance to buy tickets to see them again. The opening act was a local band called Algebra II, a three-piece band with a cellist in place of a bass player. Their set was a mix of upbeat and mellow tracks that included a cover of the English version of “Laisse tomber les filles” by France Gall. One thing that stuck out to me was how well the cello could be heard in the mix, a massive departure from the disappointing acoustics at CHON’s Asbury Lanes show. Overall, it was a good set that set the stage for the main act. Charly Bliss’s set opened with a new song “Blown to Bits,” a synth-driven track off their upcoming album Young Enough. From there, the band went full speed ahead with indie rock bangers “Percolator,” “Westermarck,” and fan favorites “DQ” and “Glitter.” The band also mixed in some slower tracks like “Gatorade” and “Ruby,” a song about frontwoman Eva Hendricks’s therapist. She would take breaks to banter with the crowd and encourage us to sing along to the songs, which we all did very loudly. After playing their hearts out with a lively set, they “ended” with two new songs called “Chatroom” and “Capacity,” another synth-heavy track that deviates from their previous sound. After exiting the stage, the crowd chanted for an encore. Upon hearing us, they quickly got back on stage to end the night with a cover of “Steal My Sunshine” by Len. The biggest thing that stuck with me was how down-to-earth the band was. Hendricks commented on how shocked she was to see how packed the venue was, a sentiment she also shared during their Music Hall of Williamsburg show in 2017. When I met them after the concert, they struck me as being very humble with a good sense of humor. When I introduced myself to Hendricks, she joked about how I basically have the same first name as her. We then bonded over our mutual admiration for Tokyo Police Club before she thanked me for being a fan and encouraged me to see them again at their Bowery Ballroom show this July. Charly Bliss’s show at the Wonder Bar went above and beyond my expectations. Despite the small venue size, every member gave their all, and this energy was reciprocated by the audience. I can honestly say they are one of the best live bands I have ever seen, and being able to meet them was a real privilege. They earned a lifelong fan that night, and I can’t wait to see them again at the Bowery Ballroom this summer.